It was important to know the % charging rate, other products have lower speed/rates of charging ability. this device seems to look great and do the job. My preference is to have this without using the stand! This is a nice plug and use item, plug in put the phone on and off you go. I found when the phone on charge and lights off in the Bedroom the blue light that shows charging status illuminates my whole bedroom. So I found it unsuitable. I had to move it to my office. Otherwise the item is very well made. shows blue when charging , shows blue when not charging , i.e when fully charged was expecting it to change colour when fully charged. 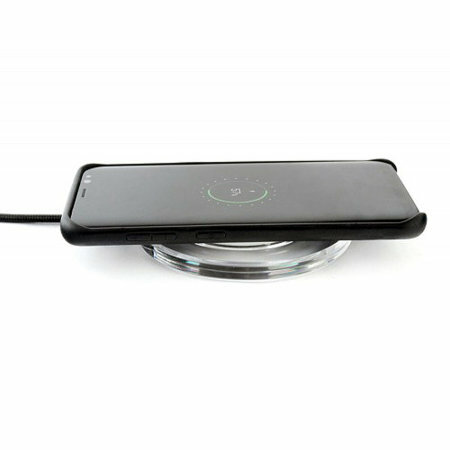 This is my first wireless charger and it sits nicely on my table just like a coffee mat and it is quite intuitive just to place my phone on top of it to keep it charged. It works well with my silicone case but not so much with my thick armour case. I can live with that .